Composer. Mariko was influenced by a music teacher in elementary school and she decided to become a composer. After graduating from Kunitachi College of music, she learned music at Berklee College of Music. She started to sing and compose music influenced by everything around her. In 2008, she created original way to train chorus group and has been singing with them all around the country. Yukino was born in Fukuoka. 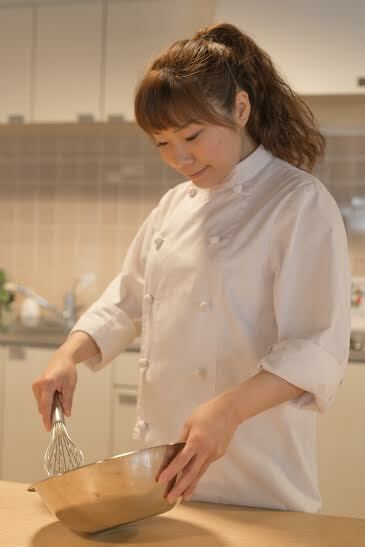 After graduating from Waseda University and L’ecole Vantan、she decided to become Patissiere to make people happy. She was a part of the team when Chef Hironobu Tsujiguchi established his own pastry and baking class Super Sweet School Jiyugaoka. She had done her own baking event in New York. She opened her no measurement baking class "happy sweet stduio" in Futakotamagawa, Tokyo in February 2016. She has been working as a supervisor for local souvenirs such as "Sakurae Financier" in Gotsu, Shimane. You can find her recipes in sweets magazine "pretto". This is her 2nd time to join MSTERIO. She had been working as a photographer in New York since 1991. Since she saw 911 terrorist attacks in 2001 from her home in Manhattan, she have visited and photographed Holy Lands of Prayer such as Israel, Palestine, Native Indian lands, Mexico, Greece, Ukraine, France, Angkor Wat, as well as the Yunnan and Tibetan temples. From 2005, she began shooting the Ise Grand Shrine and the transitions which happens every 20 years, and it became her lifework. She won Shinto Cultural Association Lifetime Achievement Award in 2015. Her photography collections were given to G7 leaders at G7 Ise-Shima summit in 2016. Her works has been exhibited in museums in Japan, New York, Monaco, Israel, and Europe. She has appeared in all forms of media around the world, and have participated in many lectures as well as published her work. She participates in MSTERIO every year. Kosuke is from Nagano. After graduating from Yokohama National University Graduate School, he acquired Educational Personnel Certification for Health and Physical Education. He had accomplished crossing Eurasian Continent, 12,5000 miles, by bicycle in 2011. He started the project “Connecting children all over the world with one thread”, which is a basis of his NPO and succeeded to connect 5,003 children. In 2012, he joined Long Distance Triathlon World Championship. In 2013, NPO Connection of the children, which is specialized in traveling and education was established. Currently, he is providing educational program “Plavelcation” to experience the world and running the place called “CasaCo” where you can be connected to the world with Yokohama City. His project to connect people with one thread has been reached to 9468 people in 46 countries. Projects in Coc is now researching about educations for kids in the future. At the same time, he is working as a member of Bodytune-Partners educate grown-ups to stay healthy and active. He is enjoying cooking international cuisine at CasaCo, Japanese tea ceremony and flower arrangement, slacklining and bouldering during the weekend. He has written a book “A bicycle trip crossing Eurasian Continent 20,000 km”. This is his second time to join MSTERIO. 『Miss Saigon』,『Memphis』This fall she will be back in 『Miss Saigon』(Imperial Theater etc.) again, and this time she will work as an assistant choreographer for a choreographer from abroad. This is her 4th time in MSTERIO. She has been a choreographer for Santas for MSTERIO Holiday party. Naoki is a calligrapher (following the Shinyo Style) from Gifu. His pseudonym is Ginsui. Naoki first came to Tokyo in 2007, where he held exhibitions in Bunkyo-ku, Setagaya-ku, and Shibuya-ku. His main activities include teaching calligraphy, holding exhibitions and lectures, and providing letters for name plates, business cards, signboards and bridal information boards. You can find his work in music videos (e.g. Shonan no Kaze, Momoiro Clover Z, nobodyknows, TM Revolution, etc. ), lyrics (e.g. Miliyah Kato), and products (sony "Xperia"). He appeared in NHK"Nippon no Geino" etc. This is his 4th year at MSTERIO. I am from Fukushima. I learned Magic by myself when I was in Kunitachi College of Music Vocal Music Department. After I graduate, I had been working as a teacher and Japan Overseas Cooperation Volunteers. In 2004, I started to work as a first magician in the Super Eccentric Theater Company. Hello everyone, I’m TANJI!! I used to teach music in Zimbabwe (Africa), Saint Lucia (South America) and countries in Asia. I decided to transform into Magician because I wanted to see much more happy faces. I met more than a hundred thousand (probably) people through magic. However, I lost function of one of my fingers, which is very important to magicians, last year during my show. I was very upset but my best friend Asako Tamura, who is an opera singer, told me that I can be a “singer song magician” and made a magician surprise!! I had been giving up singing so her advice made my life. The doctor told me that I won’t able to move my finger as it was but I am trying my best to bring my finger back by rehabilitation. I am happy that I am living my life now. It is not a magic but a miracle that I get to see all of you this summer! I am looking forward to have fantastic summer together with you! I will love to know about you all!! My name is Josh, and I am thrilled to return to MSTERIO as a staff member and teacher for the new ceramics class. I teach ceramics at Mugi Pottery in New York and spent the first chunk of the summer as a TA in the clay studio at the Haystack Mountain School of Crafts. When I'm not throwing pots, I'm in my fifth year of a Ph.D. program in Japanese cultural history at Columbia. My project is on the history of food and dietary health, but too often I can’t resist eating something delicious anyway! I grew up in New York and lived in Tokyo too, but even though I’m a city kid at heart, I love to escape to the countryside whenever the weather gets warm. This is my second year at MSTERIO, and I am so excited to be coming back! I can’t wait to see all of you soon! Anthony's experience and education in the field of art started when at the age of 8 he attended Arizona State University. Art and Design has been his expression ever since. Artist of the year in 1975. An Art scholarship to BYU. The Artist who created the world famous Shopping Cart tree, an annual installation at Edgemar. He has worked at Barney's New York and the Museum of Contemporary Art. He is a part of the team at Sean O'Connor Lighting. You can also see his design work at Pasona in Tokyo. He is an interior designer and working with the retail furniture store Live Style Design studio. He is on the executive committee for "Buy local" encouraging communities to support their local business. He is Chairman of the Board of the Main street Business improvement association. He lives in Santa Monica, California and this is his 15th year with MSTERIO. A native of Kyoto, Japan, Asako Tamura has appeared with opera companies worldwide.Recently she was chosen as the first foreigner to sing the US National Anthem at an exhibition baseball game between the NY Yankees and Washington Nationals in Washington DC. Her extensive performance credits include appearances in Lucia di Lammermoor (Lucia) with the Hungarian State Opera (Budapest); Madame Butterfly(Cio-Cio-san)with the Royal Albert Hall, Baltimore Lyric opera, Teatro solis in Uruguay; I Masnadieri (Amalia) with the Sarasota Opera (Florida); La Traviata (Violetta) with the El Paso Opera (Texas); female leads in Leoni’s L’Oracolo and Montemezzi’s L’Incantesimo at the Avery Fisher Hall with Teatro Grattacielo (NY); Her many appearances in orchestral concerts include The Three Tenors (Domingo, Pavarotti, Carreras) in Yokohama, Japan; the New York Metropolitan Opera Orchestra; BBC Symphony Orchestra; Opera Ai Fori Gala Concert Orchestra (Rome) and many important orchestras in Japan. She’s participated in MSTERIO twice in a past. Seiko is an actress and a member of Haiyu-za, a theater company. After graduating from high school, she entered the film department of the school of arts at Nihon University. During her first year she was accepted into Haiyu-za after passing an open audition. Currently she appears on stage, in television, movies and commercials, and does voiceovers for foreign dramas. She is known for her ability to play a wide range of characters, including Viola in Twelfth Night, Portia in Merchant of Venice, and characters in modern Japanese dramas. In 2007-2008, she successfully produced and starred in her own one-woman play, Hana Ichimonme, in Akita, Tokyo and New York. This year, Seiko played an unique role in the premium performance of The Mousetrap, the world’s longest-running show celebrating its 60th anniversary from London, and was highly rated for her excellent acting. In 2007, she debuted as a film director, her first film winning several awards at Japanese film festivals. Her film won a prize in 2010 at one of the largest short-film festivals in Asia. She had starred in a play “Hedda Gabler” as a title role in 2015. At MSTERIO, she's been a drama director since 2005 and taking care of senior campers and CIT. She had lived in New York for 4 years(2002-2006). She resides in Tokyo. Non-profit Organization; HappyRice.jp, Deputy Director. Masashi is a humanitarian worker from Yokohama. After he received B.A. in Law in Japan and M.A. in Development Studies in the Netherlands, he started a career with Dutch and Japanese NGOs, then began international humanitarian works by exposing himself to the fields in Palestine, Tohoku in Japan, the Philippines and Afghanistan. All his missions so far are related to health, nutrition, children and women. Meanwhile, he has musical aspects: He used to be a first violinist in a Dutch orchestra, and a violin teacher in Palestine where he also made a scholarship for the young music students. He composed two violin sonatas and other small pieces, and is still eager to learn other instruments such as Oud (Arabic string instrument) and cello. First time at MSTERIO.